Gov. Andrew M. Cuomo announced $70.4 million in bridge construction projects on Long Island, including the start of construction on a $28.2 million project to replace the Walt Whitman Road Bridge over the Long Island Expressway (Interstate 495) in the town of Huntington, Suffolk County. In addition to the major bridge replacement, $42.2 million in repairs have been made on 31 bridges in Nassau and Suffolk counties. The work enhances safety on small connectors and major corridors, while ensuring continued access to the many communities, businesses and job centers located on the Island. "Safe, modern bridges are integral to supporting an efficient transportation system and laying a foundation for local, regional and statewide economic success," Cuomo said. "These transformative projects will strengthen vital connections between and within communities, making travel for Long Islanders safer and more efficient for years to come." The projects range from a large-scale bridge replacement, to miscellaneous steel and concrete repairs that extend the useful life of bridges and reduce the need for more costly future repairs. 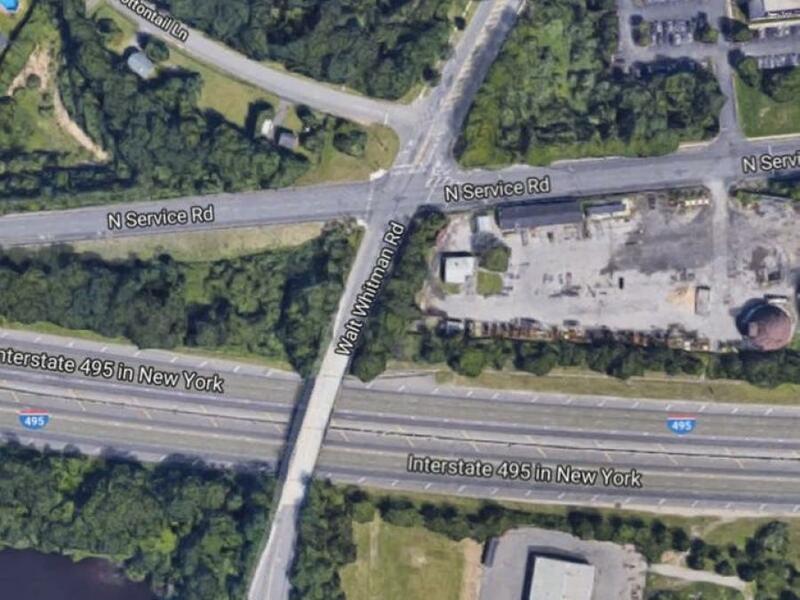 The overpass carrying Walt Whitman Road over the Long Island Expressway is being replaced with a wider bridge to better accommodate Suffolk County's growing population. The current bridge, built in 1962, sits less than 2 mi. from the Nassau-Suffolk border in the booming commercial center of Melville, the headquarters of numerous national and international companies, such as Canon USA and Nikon. Presently, the Walt Whitman Road bridge features one southbound lane, one northbound lane and a northbound left-turn lane, with a sidewalk on the west side of the bridge and no shoulders. The new, wider structure will feature five lanes: two southbound lanes, one northbound lane, one northbound left-turn lane and an additional lane to provide space for a southbound left-turn lane at one end of the bridge and an extra northbound left-turn lane at the other end of the bridge. Sidewalks will be installed for pedestrians on both sides of the highway, with shoulders for bicycling on each side. Intersections at each end of the bridge will be widened as part of the project to allow more efficient traffic flow. The new bridge is being constructed utilizing resilient materials that will require significantly less maintenance, including metalized steel girders that do not require painting and a continuous bridge span instead of a multi-span structure, which does not require bridge joints, allowing for a smoother riding surface. Construction will be staged. A portion of the new bridge will be built on the east side while traffic is maintained on the existing bridge. Traffic will then shift onto the new bridge portion, while the existing bridge is demolished and the west side of the bridge is constructed. Pedestrian access will be maintained throughout construction. Consistent with Cuomo's Drivers First initiative, the project has been designed to minimize traffic impacts. Most work will be performed behind concrete barriers and there will be no lane closures during peak commuting hours. Major work on the project will begin shortly, with completion scheduled for fall of 2020. Sen. John Flanagan said, "Local roads and bridges are the lifeblood of many economies across our great state, including right here on Long Island. I commend Governor Cuomo for focusing these critical investments to roads and bridges in Nassau and Suffolk counties, and thank all those who have worked together to repair and rehabilitate Long Island's entire infrastructure. These projects will truly enhance safety for motorists and their families throughout our region, as well as curtail the need for higher costs in the future." Senator Jim Gaughran said, "Strong infrastructure is essential to ensuring our region continues to thrive. I'm glad that New York State is taking this first step towards repairing our infrastructure and I thank Governor Cuomo for his continued investment in Long Island's bridges." Three separate projects were recently completed to rehabilitate or repair 31 bridges across Long Island. Motorists are reminded that fines are doubled for speeding in work zones. In accordance with the Work Zone Safety Act of 2005, convictions of two or more speeding violations in a work zone could result in the suspension of an individual's driver's license. For more information, visit 511NY.org.